Yet millions of online banking bill pay checks still come to our lockbox processing centers across the country each month because most billers are not properly registered in the bill pay databases. Banks are well aware of this costly industry problem: more often than payers imagine, online banking bill payments do not remain electronic. Banks are paying to print and mail online bill pay checks. The payer, who goes online to pay bills today through his or her bank’s website, expects to see that bill payment post within a day. It may be marked as paid, but the biller doesn’t actually see the payment for another week. And then there’s the biller’s bank, which loses money processing that online bill pay check once it’s finally deposited. All of that changes with Catch!, a CheckAlt solution that keeps online banking bill payments online. By enrolling billers in the online bill pay databases banks use with a turnkey solution, CheckAlt is helping ensure online banking bill payments remain electronic. It’s phenomenal what CheckAlt has accomplished with Catch!—and $5 billion in 2018 is just the start. CheckAlt has set a standard to turn on Catch! for all new clients. "It is incredibly important that we stay focused on solving this huge problem in the industry and providing our solution Catch! wherever we can,” said CheckAlt Co-Chairman and CEO Shai Stern. Click here to find more about Catch!, including a video for the stand-alone option that CheckAlt unveiled at AFP 2018. 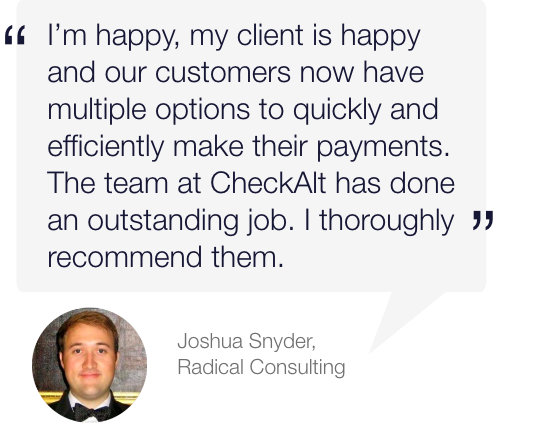 CheckAlt is the largest independent provider of lockbox and treasury solutions in the country. CheckAlt’s solutions include lockbox processing across 14 locations nationwide, consolidated item processing, omnichannel integrated treasury solutions and mobile capture services. CheckAlt’s client base includes 600+ financial institutions. CheckAlt is headquartered in Los Angeles, Calif. For more information, visit https://www.checkalt.com.